The M6 Junction 2-4 Smart Motorways Project (SMP) has, in its first four months on site, been awarded four Highways England Blue Star Awards. These are only awarded for exceptional performance or new initiatives not widely used on other sites. The first award was for a new system used for overhead protection and consists of two units which are fastened to the lightweight GRP poles and emit an electronic beam. When the beams are broken, an Intellicone sounder is activated and the lights on the unit flash and activate a sounder to warn the vehicle or plant operator that they are in breach of the height restriction. This reduces the amount of time required to set up and the risks associated with manual handling are removed. The equipment works by GPS and alerts can be sent out immediately via text message to supervisors or nominated personnel so that are aware that equipment has been breached. The second award was given for the use of the EZ Drill in fixing vario-guard in place, purchased by Asset International, and is a huge breakthrough in the initiative of achieving zero Hand Arm Vibration (HAV) by 2020. The drill rig is wheeled into place and the operative then depresses the lever and moves away from the drill. The hole is then drilled without the need for the operator to touch the equipment and a dust extraction unit is fitted which removes all dust produced, this is then collected in a specialised bag unit which is sealed and then replaced as required. The dust collection system runs on a compressor which blows air into the hole being drilled to remove any additional dust particles. This activity is now much safer, reducing the possibility of HAV, exposure to dust, and manual handling. The third award was given for banners which have been fixed to bridges within the works. These banners give the location of where you are on the site, as once works commence site can be confusing to people who are unfamiliar with the system or are new to the project. The benefits of these are that new people to the project can easily identify where they are and in the event of an incident, the location can be pinpointed more accurately than the use of chainages, which is invaluable to the emergency services. The fourth award was for the development and use of Virtual Reality (VR) People Plant Interface Health and Safety Scenarios. The tool has been developed by Navroop Rai, Josh Hanson and Matthew Hyatt. After trialling the use of an external company VR programme, they decided that developing an in-house programme through the Taylor Woodrow BIM team would prove more cost effective with the ability to roll it out to more projects. The current VR training scenario shows an excavator in operation with the ability to move instantly between a position on the ground near the excavator and the driver’s visibility. This tool helps everyone understand plant people interface with zero risk. These innovations range from very simple and easy to implement to longer term developments. 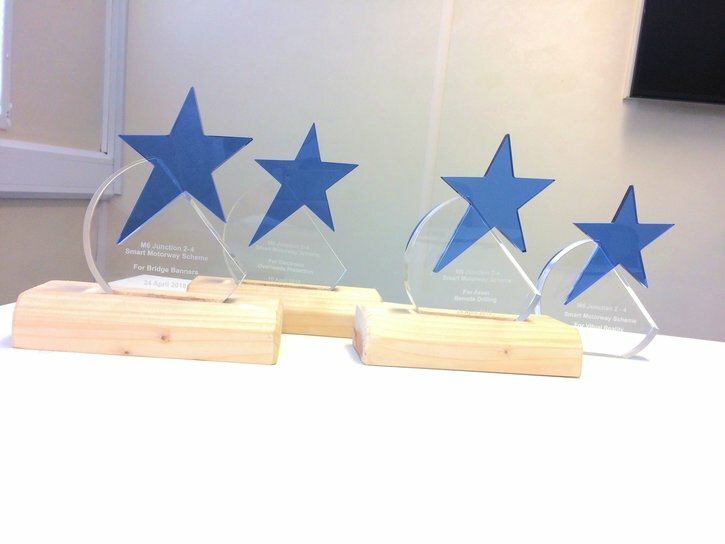 The four Blue Star awards in four months is just testament to the ongoing commitment to improvements in health, safety and innovation by the M6 team.